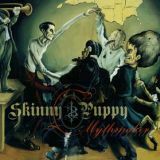 Skinny Puppy are best summed up as survivors of the Industrial scene rather than a part of it. The animal rights-obsessed Canadians have been fiercely political throughout their career and this seems to have helped drive them, even after losing a member to heroin in 1995. As much credit as the likes of Nine Inch Nails and Ministry get for popularising Industrial music, the simple fact is that Skinny Puppy were doing it first; Trent Reznor has admitted ripping the band off to create his own project. As all too many have found out to their cost, however, influence does not equal success, and although Skinny Puppy’s fanbase is committed and their theatrical live show is a thing of infamous legend, they are far too gnarly to be stars of the musical world. Even though it’s their softest in a while, far from the jerky harshness of the likes of Too Dark Park, Mythmaker is a long way from catchy – I’d go as far as calling it ‘progressive’ were it not for the fact that it’s already a pretty experimental genre. Taking steps away from the Rock-driven accessibility of 2004’s The Greater Wrong Of The Right, this is darker and calmer at once – a reflection rather than an outpouring of energy – and as a result many fans of Skinny Puppy’s more traditional sound reacted poorly to Mythmaker, but given time it proves itself to be a pretty darned good album with each subsequent listen. The band, comprised of vocalist Ogre and multi-instrumentalists cEvin Key and Mark Walk, clearly spent a good deal of time composing and orchestrating the complex music here, moments like lestiduZ nearly up there with some of Venetian Snares’ material. As far as Electronica goes, Skinny Puppy are excellent at making the sort of multilayered madness that lends itself well to modern listening – yet they’ve not lost their touch for oppressive claustrophobia, many songs here walking a perfect centre line between too much sound and too little. Opener magnifishit, for example, stops and starts a neo-Symphonic grandeur, kicking the album off well and drawing the listener in without actually revealing much. Follower daL may have female vocals, but it never becomes commercial, walking determinedly sideways in style, whilst haZe kicks off with natural sounds before heavily distorted vocals come in atop an epic soundscape, a futuristic ballad something like the sort of thing people would listen to in Blade Runner. Although pedafly takes the album into high gear with a majestic and rather disturbing groove, the best song on the album is undoubtedly the following jaHer, opening with acoustic guitar and developing into a gripping slow-burner that stays with you despite its mid-tracklisting position. Elsewhere, the claustrophobia of politikiL and lestiduZ showcase the band’s more traditional Industrial sound, piling electronic soundscapes upon the listener, and pasturN and ambiantz are more grandiose melodic explorations. As the album comes to a close with the initially dancefloor-friendly ugLi, sliding off into an instrumental close, it’s hard not to like Mythmaker for what it is – an excellent album from a band that continues to quietly explore new territory where others would have stagnated long ago.